This town-that-never-had-a-chance didn’t even have time to start a cemetery. 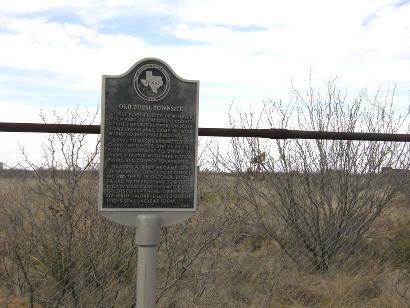 If not for the historical marker, it might have joined the long list of forgotten towns. The marker text now serves as the town’s history / epitaph. First post office in Winkler (then part of Tom Green) County opened near here (1908) on John Howe ranch. Mail came in twice weekly to serve 300 persons. 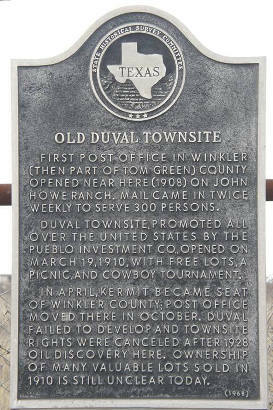 Duval townsite, promoted all over the United States by the Pueblo Investment Vo., opened on March 19, 1910, with free lots, a picnic, and cowboy tournament. In April, Kermit became seat of Winkler County; post office moved there in October. Duval failed to develop and townsite rights were canceled after 1928 oil discovery here. Ownership of many valuable lots sold in 1910 is still unclear today.